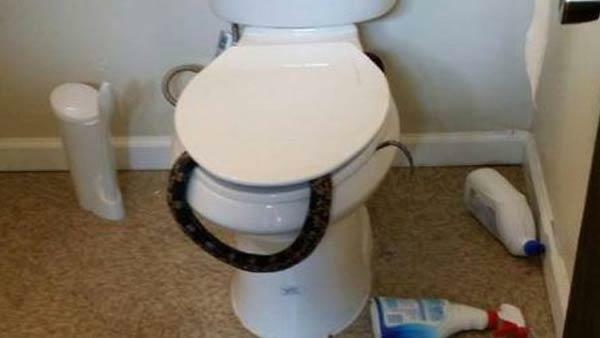 Imagine going to use a toilet and seeing a poisonous snake slithering in the commode. It actually happened to a construction worker in Hueytown, Alabama. 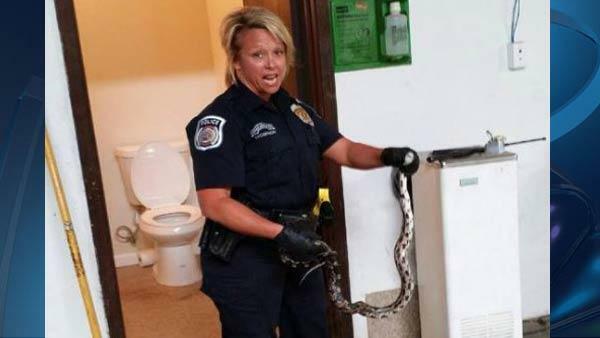 “So when I was going to use the restroom, I see a snake around the commode and I’m thinking it was a joke,” worker Willie Harris told WBRC TV. But, it was no joke. The scary snake turned out to be a poisonous cottonmouth. Harris’ boss called 911 and police officer Alice Thompson responded. She grabbed the snake by the head with the help of a couple police batons. “I was holding it actually on the corners of the mouth where the mouth was actually open at the time. Which for me, that was actually the first time I’d ever seen fangs that were folded back in a snake,” Thompson told WBRC. “Law enforcement is called upon to deal with all kinds of situations that most people never think about,” said Hueytown Police Chief Hagler on the department’s Facebook page. The snake was released back into the wild.